Company organization, lack of staff, workspace and network infrastructure: all small to midsize businesses (SMB) face problems like these in their growth process. By providing access to tools that would otherwise be unavailable to them, cloud computing enables smaller firms to become more agile, operate more efficiently, and compete and grow against larger‑sized firms. 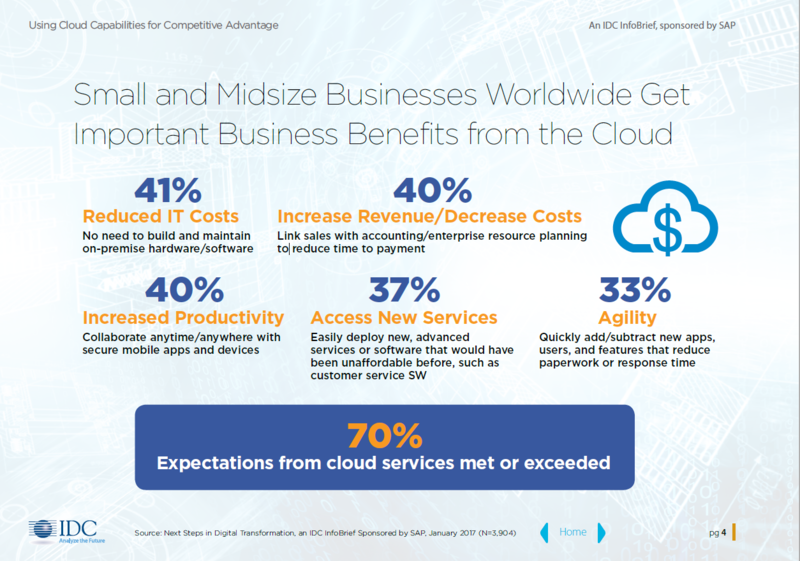 The cloud provides a way for these smaller businesses to overcome several key challenges they face when investing in IT. The SAP Business One solutions are easily scaled to meet growth needs. More importantly, SAP Business One is maintained and upgraded without the need to hire additional staff, and they do not require on‑premise resources such as space, power, and cooling. The IDC Report below shows how SAP Business One Cloud helps improve productivity. According to the report, cloud computing can help enhance back-office capabilities and allow management to focus on core capabilities. The full report is available by clicking the button below.